A teething necklace is the best of both worlds for stylish new moms and curious little ones. Made from soft, chewable silicone, the beads are made in sophisticated colors to compliment your look. You’ll stay accessorized while baby stays entertained. There’s no keeping a curious baby from your accessories—especially necklaces. Mama & Little’s silicone teething necklaces are the best of both worlds: Baby-friendly statement pieces that are meant to be chewed. 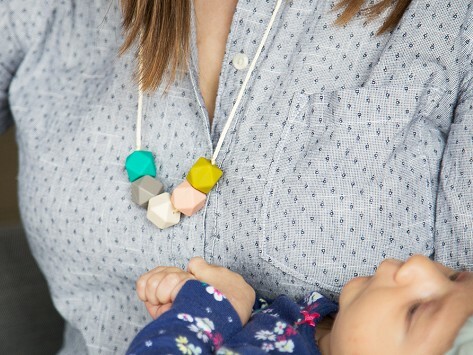 With silicone beads in sophisticated colors and interesting geometric shapes, each necklace doubles as a toy (read: distraction) for your baby. Little hands can grab, play, and bite down as much as they want, because the beads are made of safe, soft silicone. Founder Arleene Taylor had to forgo wearing necklaces when her baby son always got his hands—and mouth—on them. She decided to make jewelry that was attractive and wearable for moms, whether they were around their babies or not. The pieces are multi-functional, which we think any woman can appreciate. Just in case your baby really won’t let go, there’s a breakaway clasp. And when that necklace gets all drool-y, it can clean up in the dishwasher’s top rack.